Staring at the lens, unblinking eyes gleaming beneath his ever-present felt pork pie hat, Joseph Beuys asks the question that every artist has contemplated: “the anonymous viewer is back there, yeah?” It’s a statement of intent as much as a query, not only giving voice to a creator’s constant wondering if someone is watching, but signalling that the iconic performance artist is putting on a show for the camera. For fans of his output until his death in 1986, neither the pondering nor the playful packaging should be surprising. Indeed, there’s a reason that filmmaker and documentarian Andres Veiel (If Not Us, Who?) 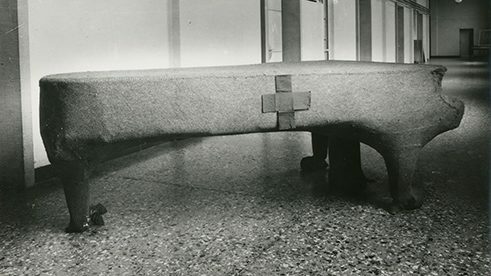 has chosen to call his documentary Beuys: Art as a Weapon; provocation and challenge were as much Beuys’ tools of his trade as the items and objects he turned into sculptures and installations, the paint and pen he splashed across pages and canvases, and the felt that he crafted and wore. Even those coming to the German creative’s work, theories and impact for the first time will immediately spy his proclivity for pushing boundaries not only in his pieces, but in his behaviour — and, for doing so to ensure that the world was taking notice. The documentary 'Beuys: Art as a Weapon' features Beuys’ life, art, influence and legacy | © Beuys: Art as a Weapon Accordingly, in charting Beuys’ life, art, influence and legacy — his childhood, war service, and struggles with loneliness and isolation among them — Veiel continues with the approach he employs at the documentary’s outset, largely letting his subject do the talking. A cheeky chat where Beuys compares talking to the camera with being in Hollywood is followed by a plethora of similar footage, flitting between his art, both during its creation and in its installed and finished forms, and his public utterances. He devises pieces and moments designed to send a message, whether planting 7,000 oaks or whispering to a hare. He speaks of the meaning of art, of being forced to use everything at his disposal and of stirring up the status quo. Cobbled together from hundreds of hours of materials, his actions and words paint a portrait of an artist purposefully making a statement with every deed and utterance — teasingly so. Here, grunting into a microphone in a room filled with dignitaries says as much as waxing wise and lyrical about the nature of creativity, both of which Veiel includes in his deftly compiled effort. Occasionally, modern-day interviews from Beuys’ contemporaries fill in the gaps — critic and curator Caroline Tisdall discussing his infamous ‘I Like America and America Likes Me’ interaction with a coyote, for example — though they’re never as revealing or resonant as the film’s source. While stitching together documentaries about deceased subjects using archival snippets, images and recordings has become increasingly commonplace, with Senna, Amy, Listen to Me Marlon, Cobain: Montage of Heck and I Am Heath Ledger all doing the same, Beuys: Art as a Weapon doesn’t merely jump on a trend, but uses the best method to chronicle the man at its core. That the end result proves both fascinating in its intimate creative and ideological minutiae, and complicit in the furthering of Beuys’ myth-like backstories and status, is, of course, fitting. 'Beuys: Art as a Weapon' doesn’t merely jump on a trend, but uses the best method to chronicle the man at its core | © Beuys: Art as a Weapon That said, while Veiel’s cinematic tribute provides ample instances of its central figure doing what he did best, it’s not without its limitations. 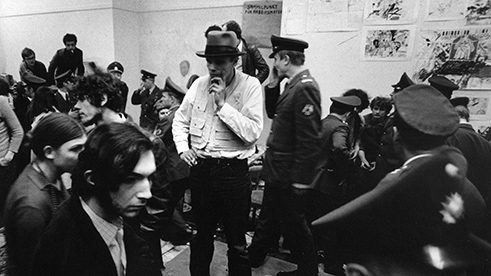 The best artistic explorations lay bare the person behind the pieces, and though Beuys: Art as a Weapon demonstrates how intertwined the two are in this case, it presents more than it probes. 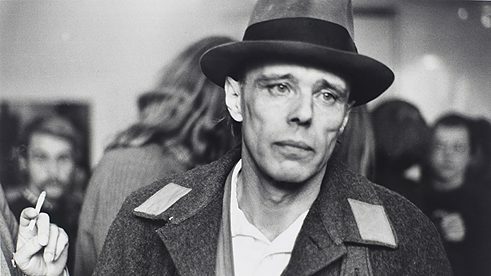 As a feature made in his image, the film offers a welcome wander through his distinctive mindset; as an examination and a piece of analysis, it favours the what and how of Beuys’ output, and the impression he made on the global art scene, over the why. Still, spending time delving into his orbit remains an engaging and immersive experience, even if becomes the movie equivalent of softly caressing Beuys’ beloved felt rather than ripping away at it like a wild animal. BEUYS: ART AS A WEAPON screens at Melbourne International Film Festival 2017. Please see ‘related links’ in the right column for screening dates and tickets.